Helping You Find Your True Beauty! In a world that pressures you to look "picture perfect", join in the search to find your true beauty in Christ! It's there, but just needs discovered. Get Real inC - For Girls Only! It's hard to fully put in words what God did in my heart this past week. It happened in nature and solitude. A retreat in a lake cabin in Minnesota where some friends we met on one of our speaking engagements invited me to stay...what a blessing to have this time to unplug from the world in order to plug into Jesus. Because I am an extrovert and get energy from being around people, spending time by myself in solitude is often difficult. It takes some time for the waters of my soul to settle in order to hear from God. And this time was no different. It was awkward at first and I found myself missing my husband. I had dropped him and his friend David off at the Boundary Waters for a canoeing/wilderness trip on Sunday morning and then drove to the lake cabin by myself. I had no way to even call my husband and talk because he didn't get cell phone reception where he was canoeing and camping. Nevertheless, this time of solitude ended up being very fruitful in my heart. Have you ever thought about taking a retreat by yourself to practice solitude? If not, I encourage you to try it! Even if only for a few hours in a local park or a few days in a retreat center, it can be a powerful time of spiritual growth in your life. I know every time I have taken time for solitude, it has been impactful. My first retreat was less than two full days and I think that was all the time by myself I could handle. But, some very significant healing happened on that trip from some hurts of the past. So, what a blessing it was to have this time of solitude with God in nature once again. 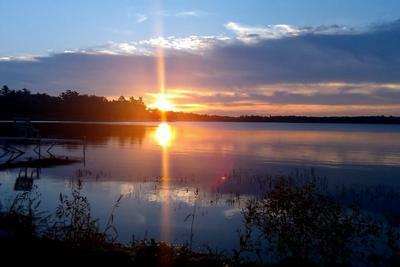 My favorite time of the day was waking up to watch the beautiful sunrises over the lake and listening to the loons. So. Very. Peaceful. FindYourTrueBeauty.com was created to be a place to help and be helped. It's designed to be a community of girls and women finding their true beauty in Christ. Here are some ways people are reaching out to one another and encouraging each other! Many girls and women share their stories on my website to offer hope. If you need encouragement, read a few of these powerful testimonies today! 5. Get REAL inC - For Girls Only! On August 14th, our community launched a ministry called Get REAL inC (we're not incorporated, but in Christ!) with a big event called Get REAL & BSMRT addressing many of the tech traps teen girls face every day including sexting, social media, etc. God opened the door for me to speak on REAL Beauty at the event and got me excited about Get REAL inC! Not only do they host annual events in the community but they follow up the events with individual and group mentoring. We had a blast. Over 250 teen girls and their moms attended our event and launched this ministry in Findlay. Having a youth retreat or conference? Bring CJ and Shelley to Your Next Event! Has this website encouraged you? Do you have any comments or ideas? If so, I'd love to hear from you. Just reply to this e-mail and tell me what you think! And help us by spreading the word. Tell your friends to check out www.FindYourTrueBeauty.com and to sign up for this newsletter. In doing so, you'll be giving her a gift...a free PDF copy of my book, "Mirror Mirror Am I Beautiful."